National University 2016 seasons masters final result has been published 14th march 2019. The 2016 Masters (Regular, Irregular, Grade improvement, Private and CGPA Development) final part exam began on 27th October. Detailed Exam Routine of Written and practical examination can be found at the universitys website www.nu.ac.bd. Marters Final Examinations were begin at 1.00 pm every day. This year, total 2 lack candidates of different colleges across the country, in 31 subjects was participate the National University Masters final exam 2018. The detailed Masters Result 2019 is available on the website www.nu.ac.bd and www.nubd.info. 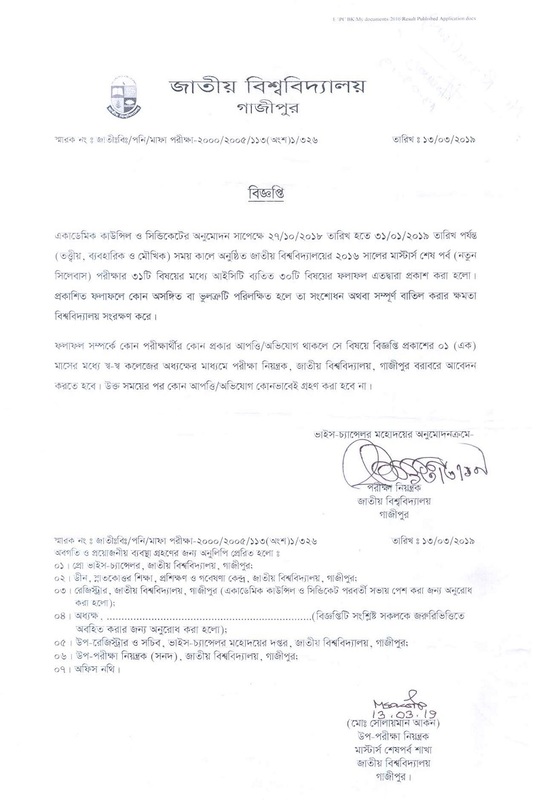 Besides, detailed information including Masters Exam Result 2019 can be found on our website result.planetbangla.com. Note that on August 29, 2017 the results of the National University Masters Final Result were published. Last year passed 77.24 percent of the total candidates. Visit the National University website http://www.nu.ac.bd/results/ to view the results. Then select the masters final from the list options on the left side of the results page and then put for your roll / registration number in the search box and the year of the examination. You will get your desired Masters result 2018. If there is any complaint or objection to your masters result or objection to the result, then the application can be applied for the result correction / re-evaluation through the website www.nu.edu.bd. If there is any objection to the result, then after 30 days of publication of results, apply online through the university’s website. After 30 days, the University authorities will not accept any complaint.